"This is my family's favorite bread. Cracked wheat and oatmeal make it a delicious and hearty loaf that's great for any kind of sandwich." 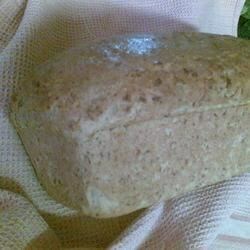 Place water and cracked wheat in the pan of the bread machine; let soak for 1 hour. Place remaining ingredients in the pan of the bread machine in the order recommended by the manufacturer. Select cycle; press Start. This bread didn't rise very high and didn't have a lot of flavor. We wouldn't make it again. Delicious, light bread with a crunchy crust. I used the bread machine to mix the dough, then baked it in the oven at 175C (350F) for 40 minutes. A very good bread. It was very light and crunchy. A definate keeper! having a hard time with this recipe. Once I get the bugs out (not using a bread machine) I'll rate this differently. Excellent bread! I put a couple of teaspoons of flax seed in it and it is great either way.